The article is an attempt at interpreting the function played in Jarosław Iwaszkiewicz’s story by two female characters. In most important research in Brzezina (The Birch Wood) literary historians exclusively indicate the leading role of two brothers. Malwina and Barbara, two background figures, are, however, rightful heroines of the drama taking place in Boleslaw’s ranger’s station. Only when analysing such a complex relation can we deeper understand the prose and comprehend the reasons Iwaszkiewicz gave such a mysterious title to his piece. 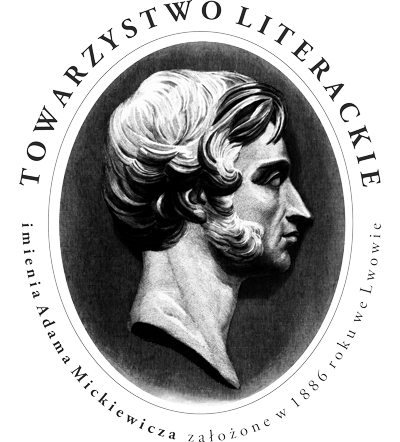 The aim of the article is to present the mode in which the Polish philosopher and writer Leszek Kołakowski in his stage piece System księdza Jensena, albo Wejście i wyjście. Farsa w dwóch aktach naśladowana z różnych autorów, nieoryginalna. Polemika optymistyczna z Beckettem (The System of Jensen the Priest, or Entry and Exit. Farce in Two Acts Imitated after Many Authors, Unoriginal), originally published in “Dialogue” no. 6, 1965, refers to the Irish author’s literary creativity. Experimenting with it, the Polish writer quotes Beckett’s most crucial temporal categories such as waiting, non-accomplishment, repetition, boredom, and change. The researcher also discusses the literary consequences of common to both writers predilection for parodying and/or travestying well known philosophers’ views. She furthermore proves that the main aim of Kołakowski’s experiment with Beckett’s output was to deride such worldview proposals which are detached from experience and filled with optimism and belief in justice and progress, not a mere polemics with the author of Happy Days as signaled in the title of the stage piece in question. The present article ponders upon the connections between Edward Stachura’s selected ideas developed in his prose pieces and the reflections of Western European, American and Latin-American philosophers and men of letters (e.g. A. Schopenhauer, H. Bergson, R. W. Emerson, M. Heidegger, A. Mickiewicz, M. Białoszewski, J. L. Borges). Indications of the dependencies and affinities allows to place the difficult to classify due to its autonomy Sted’s creativity in a broader cultural context and to show its phenomenon as a consequence of solutions practiced earlier by other authors. The article attempts to reconstruct the significance of “reversed sacrum” category in Jan Błoński’s critical discourse. The author polemicizes with the thesis according to which metaphysical subject matter was to have been openly clarified by the critic no sooner than in his 1985 volume Kilka myśli co nie nowe (Several Thoughts That Are Not New) and she shows the way it was problematized earlier, that is in his 1960s papers. Starting with the assumption that Błoński was predominantly interested in the 20th century religiousness and its emergence in a distorted and parodic shape, often even mockery one, the author analyses his texts on Francophonic theatrical avant-garde (Michel de Ghelderode, Jean Genet, Antonin Artaud) and asks how the conclusions drawn from the books translated into his attempts to reflect on the Polish culture. Traps and perils connected with it are shown as based on the changeable interpretations of Leopold Buczkowski’s creativity. The article is a detailed analysis of Leonardo Sciascia’s creativity reception in Gustaw Herling-Grudziński’s works. Herling, fascinated by the Sicilian, attempts not only to approach to the literary genetic and stylistic problems of Sciascia’s novels, but also to the themes discussed in them and the ideological stance they adopt. Sciascia, who in his creativity often based on source materials, is exceptionally close to Grudziński, an indefatigable reader of Italian chronicles. Grudziński not accidentally highly evaluated Sciascia’s book Morte dell’Inquisitore based on facts. Such interest tells much about his own creativity. The author of the paper aims to argue that Grudziński intentionally displays such Sciascia’s individual traits which he might recognize as characteristic also of his own and views the Sicilian writer’s output as a unique lesson about Sicilia with which he is enchanted. Jerzy Pilch’s writing is normally associated with pastiche, parody, postmodern play with convention. His latest mini-novel, in its title referring to the Biblical tradition, suggests some other trope of reading. When read from a kerygmatic interpretive perspective, Pilch’s text reveals to its audience a totally different dimension of writing. The protagonist, often putting on a mask of a cynic, conceals a deeper–kenotic–dimension of his personality. Self-emptying and humility (kenosis), common to Diogeneian School and Christian tradition, points at the importance of crisis as on the seminal existential experience which leads to liberation. The present sketch is aimed at an analysis of the relations between a literary report and literature. In establishing those connections it is vital to pay attention both to the diachronic changes showing the way a report and its producers over a span of centuries became independent from literature, as well as to the changes in the genre’s poetics. A likewise important element of the analyses in question is a focus on the autothematic statements by the writers themselves (such as Melchior Wańkowicz, Hanna Krall, and Ryszard Kapuściński) who, reflecting on the frames of the genre, many a time touched the issues connected with journalistic and artistic forms interaction. The nineteen letters by Maria Dąbrowska and Stanisław Stempowski selected from the corpus of their correspondence were written in the years 1924–1939. 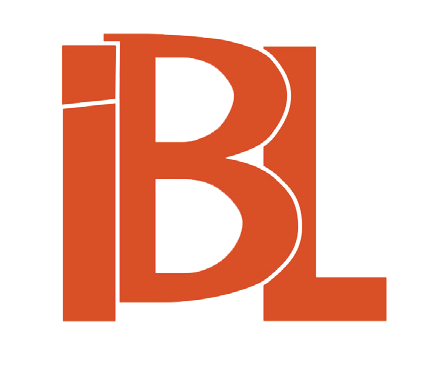 They represent a sort of epistolary writings characteristic of them in which everyday problems are intertwined with reflections on their works, their coverage on literary and cultural events as well as current political and social issues. The whole correspondence by Dąbrowska and Stempowski from the years 1924–1951 amounts to a thousand and thirty eight extensive letters which, as in the lens, focus on histories of the Polish intelligentsia, its ambitions as well as their ethos of life and work. The published material is a critical study of a collection of 16 letters which Teodor Parnicki (1908–1988) wrote between 1944 and 1946 from Mexico to Jan Erdman (1906–1986) and his wife Marta (1921–1982) to the United States of America. They give an insight into the writer’s condition in the earliest years of his almost 15 year stay on the North American continent and show the problems he faced after he stopped working in the Polish Embassy in Mexico where he held the position of cultural attaché. They also represent his assessment of the political situation which took place in Poland after the World War II. First and foremost they uncover his deepest motives that influenced his decision to remain an emigrant. They are viewed as a kind of artistic independence manifesto as well as a sign of fidelity to Polish literary tradition and a writer’s vocation. One can follow the writer at work in this period of his creative life, during which, developing various plots with a growing feeling of solitude, he was earnestly striving to renew the historical novel as a literary genre. The outcomes of such endeavours are the first part of Słowo i ciało (Word and Flesh) and Koniec “Zgody Narodów” (The End of the “Concord of Nations”). 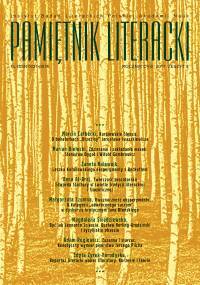 The review discusses a book on Lviv literary criticism 1894–1914. 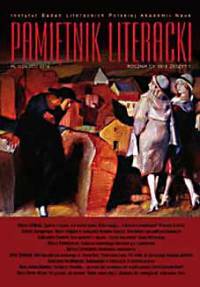 Its author reconstructs the methodological approach and the mode of presenting the issues connected with literary critical and meta-critical discourse of modernist Lviv. The review points at the advantages of the book as well as on the research perspectives the author opens. The review discusses Beata Garlej’s book Warstwowość dzieła literackiego w ujęciu Romana Ingardena. Koncepcja, rozwinięcie, recepcja (Roman Ingarden’s Literary Works Stratification. Conception, Development, Reception). Garlej reliably presents the fundaments of philosopher’s stratified conception, and seeing the literary work as an intentional object, she demonstrates the dynamic unity (stratification and phases) of artistic texts concluded with aesthetic concretion. The review is a discussion on Wojciech Tomasik’s four monographs about railway in Polish culture. The superior categories of the issue’s critical view are “modernity,” “modernism,” and “modernisation.” The reviewer, employing the tools from Marxist historiography and history theory, also points at the concealments and gaps of the cognitive project which Tomasik formulated in his books.